Oregon Rediviva | Cosmopolitan, Portland? Really? But this is not an essay on The Hazelwood and its sweets, but rather to the point that Portland does not have, nor has it ever had, a reputation for cosmopolitanism. Yes, it has had its share of immigrants and sojourners, travelers and traders; but that New Englandish pall seems to have kept the manifestations of cosmopolitanism to a minimum. In December 1962, the Cosmopolitan Motor Hotel opened at the corner of NE Grand Avenue and Holladay Street, plonked sort of halfway between the new Lloyd Center shopping mall and the new Veterans Memorial Coliseum. Though only a modest five floors in height, it boasted a rooftop dining room touted as “Top of the Cosmo,” headed by a Swiss-born chef, Ernest Herzog. 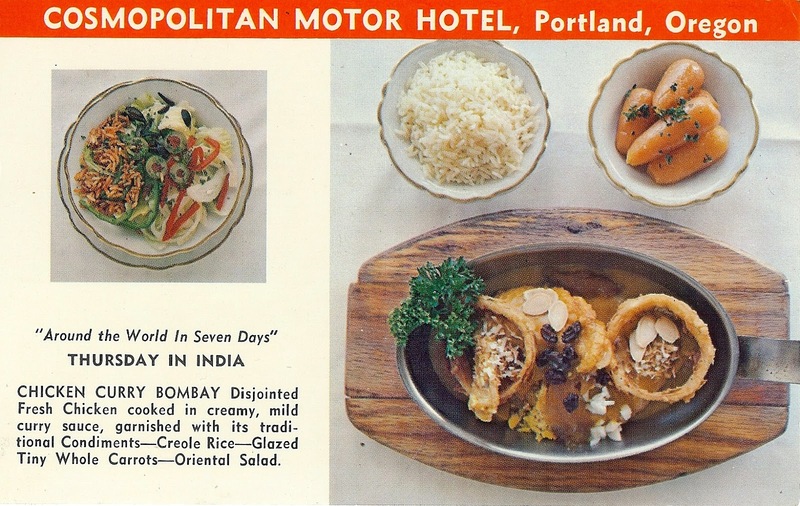 Herzog had experience in Puerto Rico and at the Portland Sheraton (another new hotel, located at Lloyd Center) before coming to the Cosmo, where his menus featured “Oregon grown fresh chicken” in 1963. 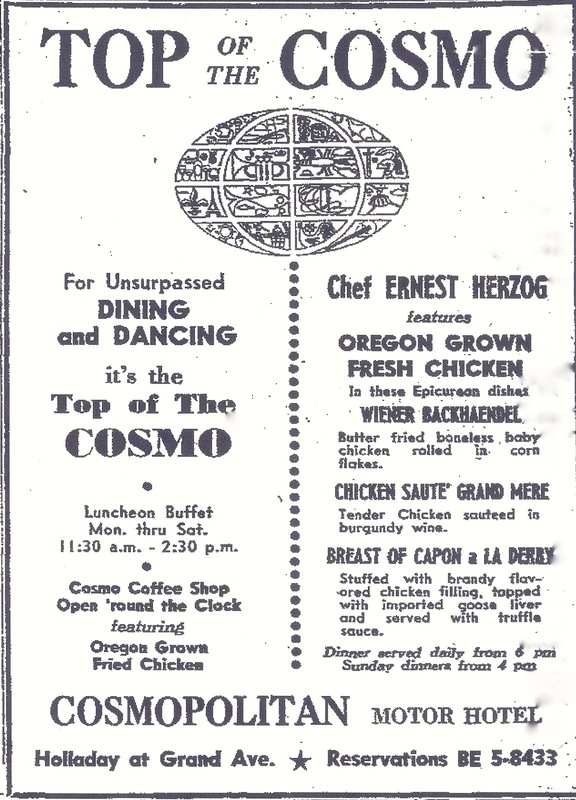 By 1964, Herzog and the Cosmo were advertising a menu that went “Around the World in Seven Days.” While the Top of the Cosmo may not have made much of a difference in advancing Portland’s cosmopolitan credentials, over time Herzog did make an impact. He was one of the first members of the Chefs de Cuisine Society of Oregon, and he went on to head his own restaurant, the Swiss-themed Matterhorn in the early 1970s. The Cosmopolitan Motor Hotel is today the Red Lion Convention Center, and the Top of the Cosmo is called Windows Skyroom and Lounge. It appears that what goes on there today is almost entirely pre-sports-event drinking–no longer is it a place to go for some adventuresome, cosmopolitan dining. Fortunately, now there are many other options for culinary explorations. What was the decoration on top of the Motor Hotel/ Restaurant–a red, checkered ball that revolved? Please contact me. I'm looking to connect some history with memory. cterrill@cu-portland.edu. The top of the Cosmo…. Been there many times. But I remember going there for Christmas morning Breakfast a number of times..
Also hit up the Matterhorn…. Thanks for the Memories..I had forgotten all about those places..